MailStore Home 12.0 is the latest version of the free email backup software for Microsoft Windows devices. We have followed development of the email software since 2011 when we released our initial review of MailStore Home. Back then, we found it to be an excellent program for backing up online email accounts and local accounts in programs such as Microsoft Outlook or Mozilla Thunderbird. The program is updated regularly with new features and support for new versions of Windows or new software email programs. 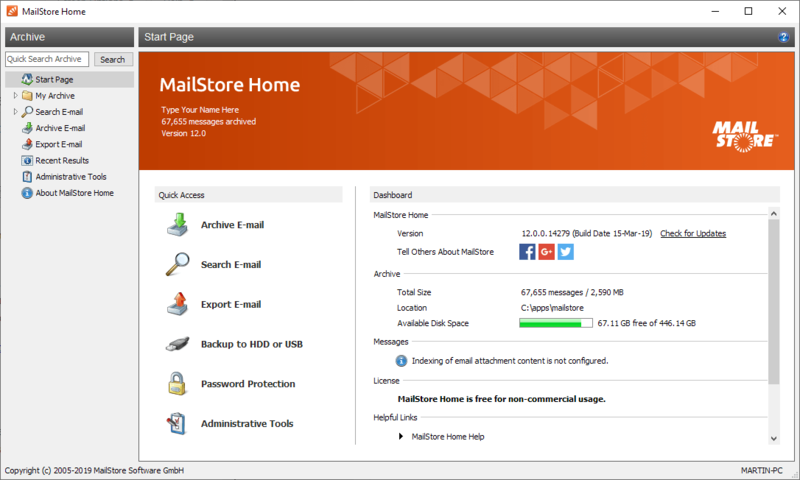 MailStore Home 12.0 is available as a download on the developer website. Installed versions of the program may notify you of the new version if you have enabled automatic update checks. You can install the new version on top of existing versions to upgrade them automatically. Another option provided by the installer is to install MailStore Home as a portable version which makes it an ideal tool to carry an archive of emails with you on a USB Flash Drive or other storage device. MailStore Home 12.0 is a major new version but the feature additions aren't that spectacular. The reason why it is still a major version is that the developing company linked development of the free Home version with the commercial version; the latter received lots of new features. The official changelog of MailStore Home 12.0 lists four changes, two fixes and two improvements. A big improvement, probably the main improvement in MailStore Home 12.0, is that the program runs integrity checks automatically whenever an archive is opened. You could run data integrity checks in previous versions manually already by selecting "Check Data Integrity" under Start > Administrative Tools but MailStore Home 12.0 checks the integrity automatically whenever you open an archive (an email backup) in the application. The other "improvement" adds G Suite to the trademark list. MailStore Home 12.0 features several fixes, some minor unnamed fixes and improvements, and a fix that addressed an issue in HTML Mime parts with too high recursion depths which resulted in them not being shown correctly. MailStore Home is one of the best email backup programs for Windows; it supports online and local email accounts, and can back them up with little effort on the user's side. The program has a read-only interface for all backed up emails, search functionality, and a lot more that comes in handy in case you need to find a specific email. MailStore’s web site shows MailStore Home 11 in large fonts, but under the download button it shows Version 12.0. So, Martin’s landing page is correct. I’m sure MailStore will change the headline 11 to 12 soon. It was confusing at first. What surprises me a bit is the version number 11.x to 12 given the changelog doesn’t appear to be that important (2 improved and 2 fixed features). Thanks for the article Martin. I was just bemoaning the fact that there is no good way to back up my email and remain confident enough in the backup to delete the original from my email client. Many years ago, I used Keynote. (Remember that?) All I had to do was drag the email I wanted to keep to a note page. I just downloaded MailStore Home. I don’t think MailStore Home provides an option to change the default archive location (Documents\MailStore Home\) even if it possible to choose where to backup that archive. If I remember correctly this was possible in former versions, 7.x or 8.x, cannot remember. I haven’t used the software personally, but I assume creating a directory junction for the default storage location would be a suitable workaround. @Jörgen, you can set a custom path for your archives ONLY if you are installing the portable version; during the setup process you can choose the location/path for installing the portable app and in that directory there will be stored also all archives and settings. This is the only solution that I know for setting a custom path. There was a companion program installed with MailStore Home, “MailStor Home – Configuration” that lets users select new location, sadly network drives is not possible, ie. no NAS. So i think @jupe is on the right track. How does MailStore work? Is everything local to your computer or does anything get passed through MailStore’s servers? I guess my question is, especially since MailStore Home is free, whether MailStore has access to your data (mail) at any point during the process. 2) MailStore Home 12 is indeed not that packed with new features as most of you would expect. Not by intent, as our commercial products share the same product core. Most of the new features introduced with version 12 are features especially designed for professional usage and simply make no sense for MailStore Home or even impossible to use in a desktop application scenario. So yes, this time the Home users get somewhat of a lean update. We still hope you are satisfied with MailStore Home and keep using it! 3) MailStore has no access to your emails. The only data we may collect during usage of the product is anonymous telemetry data, though this need an opt-in from the user. Anywhere on your site to find more details about this "anonymous telemetry data"? please have a look at the online documentation https://help.mailstore.com/en/home/Administration and go to item “4.2 Submission of anonymous usage data”. “… is a major new version but the feature additions and that spectacular.” ? Thank you for that link, Roland. 1) The option is opt-in and disabled by default. 2) You can look at the data before it is submitted. This is the way telemetry should be done! Other companies could learn a lot from MailStore.